Hazardous Materials, Testing, Abatement, Design & Management Services | Eisenbach & Ruhnke providing cost-effective energy and environmental solutions, management near Utica New york, New Hartford, Rome, Madison, Herkimer, Syracuse, Cazenovia, Oneida, Little Falls NY. Hazardous Materials (Asbestos, Lead and PCBs) in buildings can be a challenge for building owners, and proper management is a necessity. E&R provides a full range of consulting services including inspection, operation and management plan preparation, response action and cost estimate determination, abatement design, project management and compliance monitoring, and public relations assistance. E&R’s Industrial Hygiene staff has completed numerous asbestos and lead-based paint surveys for school systems, municipal housing authorities, medical facilities, office buildings, industry, and residences. These surveys have included thorough building inspections, bulk sampling, hazard assessment, and remedial recommendations. A building owner’s first step to developing a management tool for maintenance of the asbestos containing materials and lead-based paint in their building is a detailed survey. 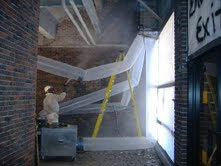 Managing asbestos and lead-based paint in any building is a complex and time consuming effort. 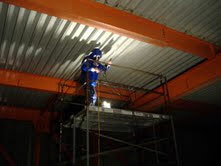 E&R works with clients in developing site specific operation and management plans. The plans involve technical application of the inspection results to development of maintenance, repair and abatement procedures, personnel training, building occupant notification, record keeping, hazard monitoring, and cost estimates. E&R can integrate these surveys and management plans into a computer-based, electronic management system. The system can be used by facility staff to simply identify were the hazardous materials are by looking at a digital floor plan, clicking an icon (symbol) on the computer screen and a full list of hazardous materials is presented for that space on the computer. The system can be used for developing work orders and managing the hazardous materials during maintenance of facilities. Based on the results of the survey and in consultation with the client, E&R will develop a series of response action recommendations. These can range from monitoring the materials and performing repairs, to abatement of serious hazards when appropriate. Once response recommendations are formulated, cost estimates and priority schedules can be compiled. 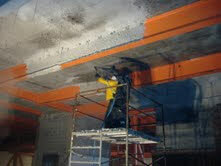 E&R is highly qualified to provide accredited abatement design and technical services. E&R has successfully completed several hundred abatement design contracts including projects for New York State Authorities, municipal agencies including city and county governments, public and private education systems, medical facilities, industrial facilities, and private companies. 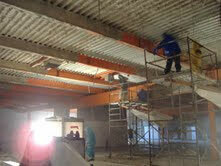 Projects are designed to work within the constraints of a given operation to minimize inconvenience and expense. Electrical, mechanical, and architectural design services are also available via a network of associated ties. Project Management and Compliance Monitoring are functions provided by E&R to allow the client more freedom from daily contact with the contractor performing abatement work. Inclusive of this service, E&R prepares paperwork related to contractor invoices, change orders, and all contractual matters as authorized by the client. E&R also conducts pre bid, pre construction, and progress meetings throughout the project. Air sampling and compliance monitoring during the actual abatement phase of the project consists of the collection of regulatory compliance samples and enforcement of regulatory and specification mandates. Project management combined with compliance monitoring provides a total service to the client with maximal utility for a cost efficient, timely, and safely executed project. E&R is aware that conducting asbestos surveys or managing abatement projects may cause concern for building occupants and neighboring or community entities. We have developed effective programs, including public and employee presentations, for informing facility and community residents of work anticipated and protective systems to be utilized. All contractors must comply with OSHA to reduce worker exposure to lead paint during renovation work. All contractors are to comply with U.S. EPA 40CFR 745.80; Lead-Renovation, Repair, and Painting Program (Lead Renovator Rule). These regulations require contractors performing renovations, repair and painting projects that disturb lead-based paint in child-occupied facilities, built before 1978, shall be certified and follow specific work practices to prevent lead contamination. The contractor must to be certified by EPA (Firm Certification) as a certified renovator and the work must be directed by a trained and certified contractor (individual certification). In school buildings, these rules apply to buildings or portions of buildings built before 1978 that house Pre-K, Kindergarten or 1st Grade, including those common areas routinely used by children under 6 such as corridors, toilet rooms, gyms and cafeterias. Minor repair and maintenance work that will disturb less than 6 sq ft per room interior, or 20 sq ft exterior, excluding window replacement is exempt. Remediation design, specification prepara¬tion, abatement supervision, and air monitoring are provided. E&R has developed strong ties with modern analytical laboratories with experienced professional microscopists. They provide a broad scope of asbestos quantification and identification capabilities. Specific capabilities include air sample analysis by phase contrast microscopy (PCM) and transmission electron microscopy (TEM) and bulk sample analysis by polarized light microscopy (PLM) and TEM confirmation for non-friable organically bound materials. The laboratories are fully accredited by the New York State Department of Health in analysis of emissions and materials for asbestos. E&R also has developed strong ties with fully accredited laboratories for analysis of environmental samples. Through these laboratory networks, E&R is able to offer a complete environmental service package to our clients.